This award is presented every year by the cancer charity Penny Brohn UK. 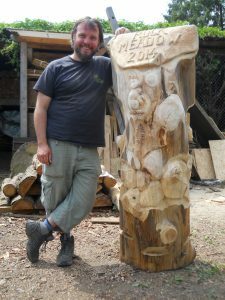 For the last three years, I have been honoured to be asked to carve each one. All of them are different in design and a lot of effort is put into making each one special to the person receiving it. 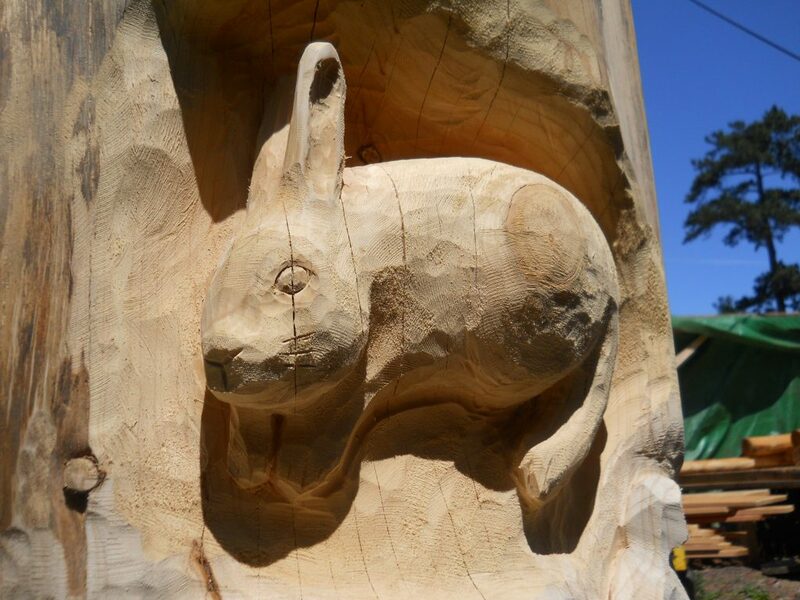 The wood used came from the Ashton Court estate in Bristol and the carving also has a small box included in the design, as the Trust wanted the award to be functional in some way. 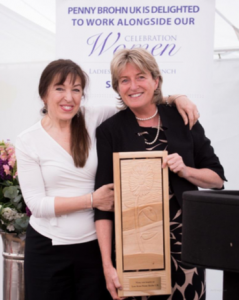 Here’s a photo of Jacqueline Gold receiving her award in May 2018. The image was supplied by Penny Brohn UK and is credited to Andre Regini. In 2017, the recipient was the perfume designer Jo Malone. Her new line of fragrances uses the scent of pomelo as its keynote and so I came up with some designs based around the leaves and flowers of pomelos. There were a few considerations that influenced the design of the award. Jo is a practical person, so it needed to be a useful object. 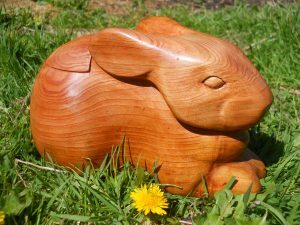 It also had to be created from a piece of cedar from the grounds of the Trust’s headquarters, which I already had left over after making the award for the previous year. 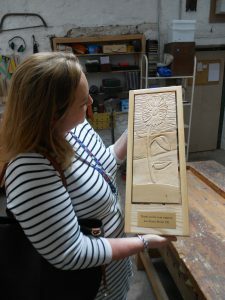 The piece was also going to be engraved with an inscription suggested by Jo’s personal assistant: Passion, Resilience and Creativity. A bowl was the perfect, practical item to make. Pomelo leaves are quite distinctive; they have a second pair of leaf lobes coming out from the stalk (or petiole) and so that was worked into the design. 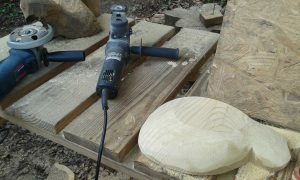 Most of the bowl was carved using power tools, as the cedar seemed easier to work with when using them. 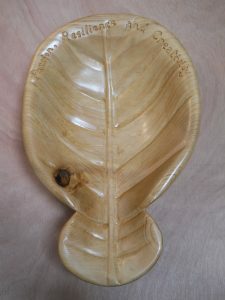 I was very happy with the finished bowl, as were the people at Penny Brohn UK. The first recipient in 2016 was Nina Barough, who founded the walks against cancer which have raised millions to fund research into fighting the disease. 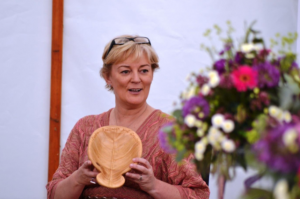 Her award reflects Nina’s love of flowers and it was carved from cedar that originally grew in the grounds of the Penny Brohn UK HQ. The piece also had to be carefully designed, to account for changes in the timber as it seasoned. I feel very proud that these inspiring people each have one of my sculptures. 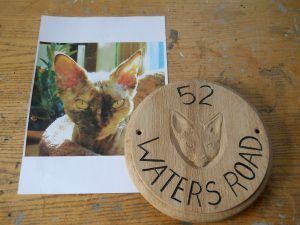 Whether it’s a new wooden house or business sign or a thank you gift for someone who is retiring, I can make it. 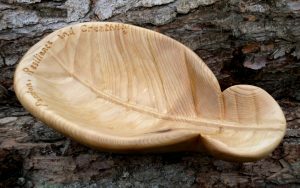 I don’t just carve signs though; many businesses have used my services before, as well as other organisations such as community groups and charities, to commission one-off gifts and promotional items. 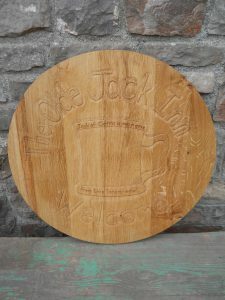 Signs are usually carved from oak that has come from sustainable forestry and finished with varnish, wax (for indoor use) or finishing oil, depending on which you prefer. I can also carve and paint any design that you would like to accompany the text and am able to carve using a large range of different fonts and styles. If you would like more information about what designs, timbers and finishes are suitable for the project that you have in mind, contact me to have a chat about it. 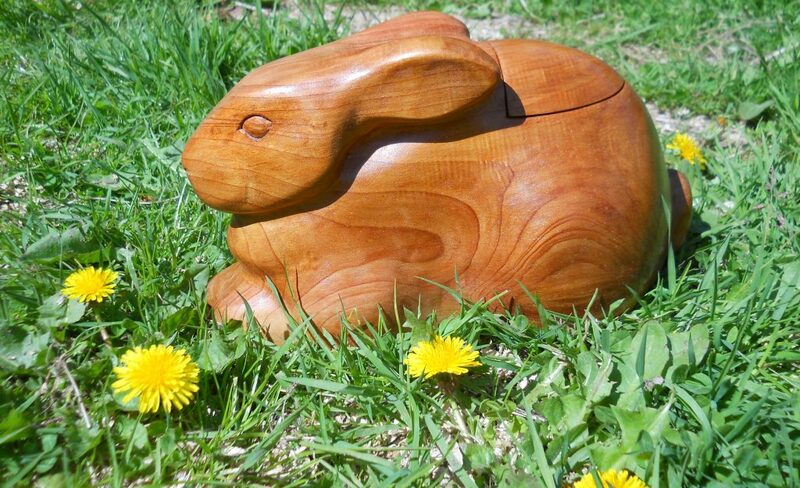 I can also make carvings from special pieces of timber, such as well-loved trees that have been cut down. 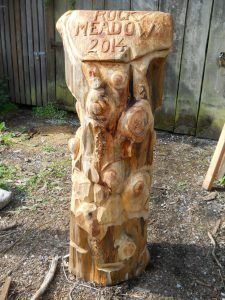 The sunflower carving above was made using cedar from a tree that originally grew in the grounds of the headquarters for the cancer charity Penny Brohn UK. 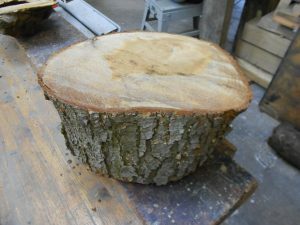 It came to me as an unseasoned log that had to be cut up and carefully joined to form the panel. 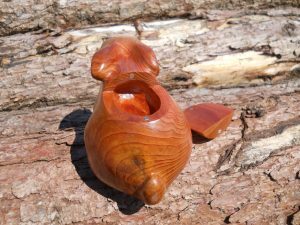 When making it, the design had to account for any movement in the wood during seasoning. 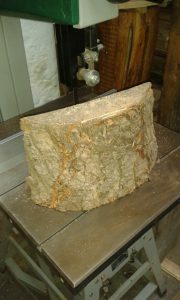 This oak carving was made for a pub in Shropshire. The ‘Jack of Corra’ is a kind of old drinking vessel, and the spelling of ‘immemorial’ is exactly as the client wanted it. 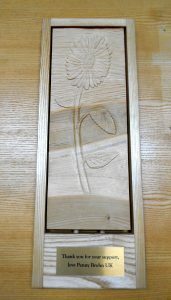 The carving was from a design supplied by the customer and was carved in very low relief, as it was to be installed on a bar and so would be vulnerable to potential knocks. 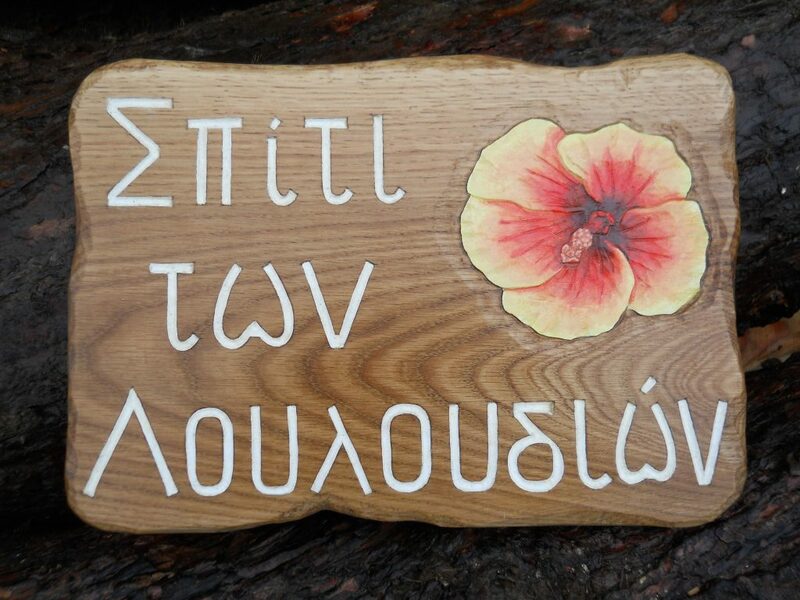 …and if you are wondering what the writing in Greek on the house sign with the carved and painted hibiscus flower means, it translates as ‘House of flowers’. 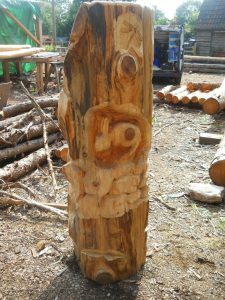 This cedar log was carved as a sign for Rock Meadow, a housing development of affordable housing in the Forest of Dean, in Gloucestershire. It shows animals and plants found in the local area, including orchids, wild daffodils, a shrew, rabbits and dormice. There are also carved rocks on it, reflecting the name of the development. The bottom of the log, below the band of carved ‘rocks’, was uncarved except for slots as it was to be sunk into a concrete base when fitted on site. Cedar is a durable timber, so the sign will hopefully last for a while outdoors. How many animals and plants can you spot in the photos?